Whoops, looks like I was announcing new versions of tChess on the Facebook page and forgot to update this page. The new version of tChess (version 1.9.0) was just released this morning and it adds a major new feature: the ability to play games with other people over the Internet via my own proprietary tChess server. This feature should be much easier to use and much more reliable than the old system of playing online games via Game Center. tChess version 1.8.3 just became available for download on the App Store. This release supports the iPhone 6/6+ display resolutions natively. It also includes a major new feature, Analyze Game, which displays a graphical overview of the current game within seconds. To my knowledge, tChess is the only mobile chess app with this feature. tChess version 1.8.2 is now available. Many users have asked for a quicker way to access the list of turn-based Game Center games, so the new version allows customization of the main toolbar (via the "Interface" tab of the main menu) and the ability to add a Game Center button. The new version also has support for certain PGN files with unusual formatting and fixes a crashing bug that occurs with iOS 7.
tChess version 1.8.1 is now available. In an attempt to make tChess look more like a native iOS 7 app, its background color was changed to white in version 1.8. Many users did not like the new look, so an option has been added to change the background color to black. This option can be found in the Appearance menu (Interface tab). tChess version 1.8 was just released to the App Store. It now uses the PGN format to represent games internally, which is the biggest single change to the app since it was released almost 5 years ago. This gives tChess the ability to handle arbitrary PGN tags and multiple annotations, Numeric Annotation Glyphs, and variations (including recursive variations!) per move. The look of tChess has also been updated to match Apple's new design language for iOS 7.
tChess version 1.7.5 is now available on the App Store. It might have the highest number of user-requested features of any tChess update ever. Headline features include: the ability to play Game Center games between tChess Lite and tChess Pro (recently made possible by Apple), the ability to send messages to your Game Center opponents, a self-play mode, printing (via AirPrint), and more. tChess version 1.7.4 is now available. The headline feature for this release is iCloud support, which effortlessly keeps your entire PGN file library synchronized between all of your iOS devices. This release also includes many other new features, mostly related to managing PGN files, which you can read about in the update notes. tChess version 1.7.3 is now available on the App Store. It adds specific support for iOS 6 and the iPhone 5's new 4" screen size, among many other new features that are listed in the update notes. tChess version 1.7.2 has just been released. It adds support for the new iPad's retina display along with smoother 2-D graphics and an optimized 3-D engine that's over 3 times faster. The biggest improvement for most users will be the redesigned menu system, which combines the Actions and Settings menus (that tChess has had since version 1) into one Settings menu with tabs, so it's better organized and easier to use. tChess version 1.7.1 is now available on the App Store. The biggest change is that it is now fully translated into German, French, Japanese, Korean, and (simplified) Chinese. iOS version 5 is now available and so is tChess version 1.7. tChess was on the leading edge by being the first iOS chess game to support real-time Game Center and is now the first iOS chess game to support turn-based Game Center play (new for iOS version 5!). Another new feature is the oft-requested ability to view annotations in PGN files, with the bonus that you can also edit the annotations via the full-screen move list UI. Additionally, tChess is debuting its first foreign-language translation, German. The next update to tChess is ready to go but requires new features that are only found in iOS 5. Hopefully the rumors are correct and iOS 5 will be released in September. Version 1.6 of tChess is online now and may be the biggest update yet! Ever since the first version of tChess over two years ago, customers have been asking me for the ability to play others online, and that's now possible with tChess's new Game Center feature! Also included in this major update is support for the iPad 2's dual core A5 processor. I developed my multi-processor search algorithms back in 2002 and this is the first time I've made them available publicly. Very exciting! Another new feature is the extended opening library. The latest version of tChess (1.5.6) is available for download. It can open PGN games with variations (ignored for now) and also exports all saved games to "saved_games.pgn" for easy backup and analysis on your home computer. tChess version 1.5.5 is now on the App Store. It adds more support for iOS 4 features: opening PGN file e-mail attachments and iTunes file sharing. tChess version 1.5.4 is now available for download. It has support for iOS 4.0 and the iPhone 4's new Retina Display. It also replaces the earlier 2-D Staunton pieces with high-resolution raytraced pieces. The latest update to tChess (version 1.5.2) is now available for download. It is a major update with new hand-painted 2-D graphics (wood and marble themes) and a new freely-rotating 3-D board view. But the big news is that it now supports the iPad, which you can read all about here. tChess 1.5 is now available for download from the App Store! tChess version 1.5 has been submitted to Apple for review and will be available soon. This is the biggest update to tChess since its original release! tChess now lets you specify an ELO rating to adjust the computer's difficulty, and it has a new "Profile" feature that allows you to play rated games against the computer and track your progress. tChess Pro also has a new PGN Database feature that allows you to download and view databases of chess games (in standard PGN format). The new version (1.4) of tChess is on the App Store now. Both Lite and Pro get the captured pieces display, and a fix so the toolbar icons return to their intended size in OS 3. A new feature in Pro is the ability to Copy & Paste games in standard PGN format, making tChess Pro one of the (very) few apps that can import games. The next version of tChess (1.4) is currently in testing to make sure it works well on OS 3.1, 3.0, and older versions of the iPhone OS. The update has many new features, including the much-anticipated display of captured pieces. tChess now has a Twitter feed which will contain more frequent progress updates than this news page. 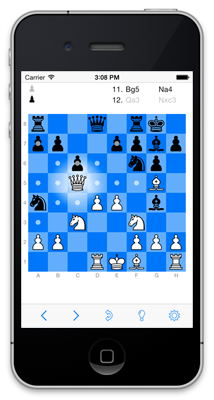 tChess Pro 1.3.0 is now available for download on the App Store. The new version of tChess, 1.3.0, has been uploaded to the App Store and will be available soon. Both Lite and Pro get major new features, including the most user-requested feature, statistics tracking. Be sure to check the update notes in the App Store for a complete list of improvements. Learn Chess is now featured in the App Store as a Staff Favorite! Learn Chess is now available on the App Store! It's an interactive e-book that teaches users how to play chess--the rules and essential strategies. And it's free! tChess Pro version 1.2.0 is now available for download. In addition to the Hint toolbar button, it has the user-requested ability to export games via e-mail in the standard PGN format. The engine strength has also been improved by approximately 50 ELO. The first update to tChess Lite, version 1.2.0, just hit the App Store! One of its improvements is the most user-requested feature, a Hint button on the toolbar. Good news! Both tChess Lite and tChess Pro are in the Top 100 Paid Games list. tChess Lite just went up on the App Store! It's a version for casual players who want an inexpensive yet high-quality chess game, and don't need the enthusiast features or maximum engine strength of tChess Pro. I just played a 10-game match between tChess Pro and another chess game on the iPhone, Caissa Chess. tChess Pro scored 90%, which means tChess Pro is over 380 ELO points stronger than Caissa Chess.